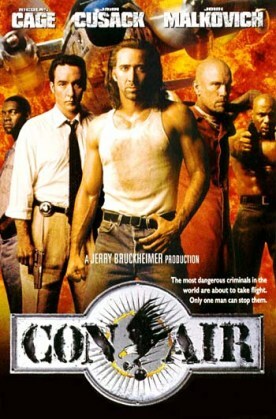 Judging from one or two other reviews I have seen, critics seem to think that Con Air, directed by Simon West and produced by Jerry Bruckheimer, is meant to be a witty send up of the macho action flick of which it is ostensibly an example. Maybe this is because Mr West has a background making TV commercials in England and is therefore assumed to be hip and postmodern and not just a glorified pyrotechnical expert. But if the picture was intended to poke fun at its own assumptions, it does not do so very successfully. Not exactly sidesplitting, I agree, but evidence, at least, that there is a postmodern sense of irony and parody at work here. As is Greene’s turning out, when unbound, to be a Lecter-like philosopher, quoting Dostoyevsky and observing of another of the superbaddies that “he’s a fount of misplaced rage” for whom “moments of levity are painful.” Unfortunately, such indications are far too few and are massively outweighed by a plethora of explosive special effects which suggest a fatal unfamiliarity with the virtues of economy of effect and understatement. Of course this may itself be a species of irony. You go way over the top in explosions just as you go way over the top in badness. But it is hard to put across an ironic explosion, and as you sit in the audience the film’s absurdly protracted ending looks designed to appeal not to sophisticates but to the usual crowd of 12 year old TV burnouts. We know how it feels.